When my daughter first started playing soccer, I noticed other parents hauling coolers and chairs and tents across the field, and I thought how silly it was to encumber themselves with so much stuff for a one hour game. I’ll never do that, I smugly told myself. But I quickly learned that standing under direct sunlight at the hottest time of the day for an hour does not feel like a mere 60 minutes. It feels like eternity. It didn’t take long for me to join the ranks of other soccer parents who do everything we can to ensure our own comfort while we yell at our kids to run faster in 100+ degree heat. I bought this Sport-Brella Umbrella and it has become one of my favorite purchases of all time. 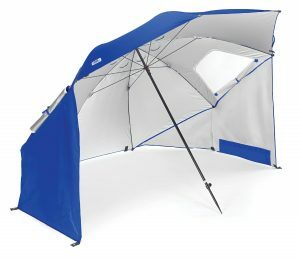 It is lightweight, easy to set up, and does a beautiful job of providing shade. You can set it fully upright like a standard beach umbrella, or you can have it on the ground like a fort (pictured above). The latter is how I usually use it, but it works great both ways. You can fit a surprising number of people (especially child-size people) under it. In fact, it’s become the preferred hangout spot for any players who are sitting out a quarter. I use a waterproof picnic blanket like this one under it and I am one happy soccer mom. As of this writing, the blue Sport-Bella is only $40.81, which is a great deal and definitely Worth Every Penny! 25% Off iRobot Roomba 870 Vacuum Cleaning Robot!